Emirates has announced that it will be upgrading one of its four daily flights between Dubai and Johannesburg to an Airbus A380-800 from 1st February 2017. Emirates currently uses Boeing 777 aircraft for each of the four daily flights between the two cities, making it the busiest route in the airline’s African network with over three million passengers carried in the last five years. 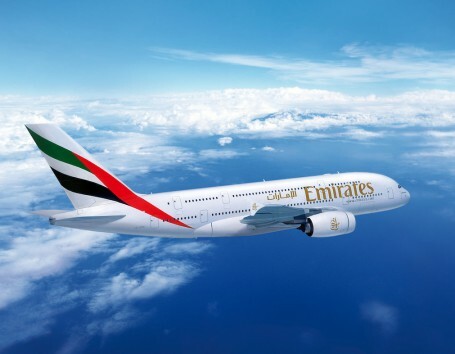 Once launched, Johannesburg will join more than 40 destinations in Emirates’ extensive global network that is served by its flagship A380 aircraft. The A380 will offer a total of 516 seats in a three class cabin configuration, with 14 private suites in First Class, 76 mini pods with lie-flat seats in Business Class and 426 spacious seats in Economy Class. It will be deployed on the first flight of the day, EK761, and will depart Dubai at 04h40 and arrive in Johannesburg at 10h55. The return flight, EK762, will depart Johannesburg at 13h25 and arrive in Dubai at 23h45. With four flights a day between the two cities, Emirates provides both inbound and outbound customers with more choice and flexibility when planning their travel, and enables convenient and seamless connections for travellers from Johannesburg to destinations across the airline’s global network, especially in Europe, West Asia, the United States and the Far East, with just one stop at its modern and comfortable Dubai hub. The Emirates A380 is renowned for its on-board lounge on the upper deck for First Class and Business Class customers where they can socialise or relax, while those in First Class enjoy the added benefit of exclusive use of the on-board shower spas to freshen up during flights. Emirates will be the only airline in the market offering premium customers these products on an A380. The airline’s premium customers also enjoy complimentary chauffeur drive, lounge access and priority check-in for all its flights at Johannesburg’s Oliver Tambo International Airport. Named the World’s Best Airline 2016 and the airline with the World’s Best Inflight Entertainment at the prestigious Skytrax World Airline Awards recently, all Emirates customers travelling on the A380 can access more than 2500 channels of on demand audio and visual entertainment on its ice system, featuring the latest movies, music, TV programmes, podcasts and games, as well as free Wi-Fi to stay in touch with family and friends during flights. As with all Emirates’ flights, customers also enjoy regionally and internationally inspired cuisine as well as the famed hospitality of the airline’s multi-national cabin crew, including South African nationals. Emirates first started services to South Africa 21 years ago and in addition to the four daily flights between Dubai and Johannesburg, it also offers three daily flights between Dubai and Cape Town, and a daily flight between Dubai and Durban, enabling global connectivity for South African travellers through its worldwide network of more than 150 destinations. The A380 service will be operated as codeshare with South African Airways as with all other Emirates’ services to South Africa. Emirates, which is the world’s largest operator of A380s with 81 currently in its fleet and a further 61 on order, serves some of the world’s most popular destinations with the aircraft, which amongst others include New York, Los Angeles, London Heathrow, Madrid, Munich, Barcelona, Paris, Bangkok, Hong Kong, Beijing, Singapore, Sydney and Auckland.